There are tacos and then there are tacos for which you will violate all social etiquette by scooping up salsa drenched meat and onion droppings with your fingers to get every last morsel of flavor off of your plate. That's what kind of tacos you'll find at La Estrella off the 60 freeway on Soto st. The La Estrella name goes a long way when it comes to the LA taco scene. 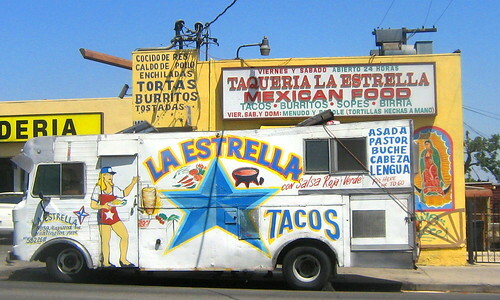 La Estrella has built a reputation from Pasadena to Highland Park for delicious small tacos that pack a punch. That's why when my plate of tacos were ready and I saw the mini-burrito style tacos I realized that this La Estrella may not be part of the La Estrella chain . These tacos are larger , the salsa is a little more subtle(not the shot of spice you'll find at the other La Estrellas) and the price is a wallet pleasing $1.25 per taco. On this day the toasted corn tortillas were not enough to hold all the chunks of tender al pastor and charred bits of carne asada that fell on to my plate but I happily used my fingers to scoop up anything I missed. And with a cold bottle of mexican coke to chase every last bite it was the perfect way to start the weekend. Oh my these look truly amazing. We have a little hole in the wall place where we get Mexican food, but the tacos don't quite look like this. so, who won the book? I am very proud to know th owner Jose, and to have been his customer for over 20 years,now i live in Arkansas but visit the restaurant every chance i get. The tacos are very straight forward no middle of the road they are full of flavors and consistency is king here, i am yet to have a bad taco. You have 2 choices of tortillas hand made,some 5 days out of the week $1.25 per taco, and traditional tortillas at a $1.00 dollar per taco same price in 20 years!!!. I will add that they also have wonderful flautas made by el Guerito (the Chef) with rice and beans. Just to clarify the "La Estrella Taqueria" is on Lorena ST just south of Whittier BLVD right Off the 60 freeway exit Lorena /Whittier. 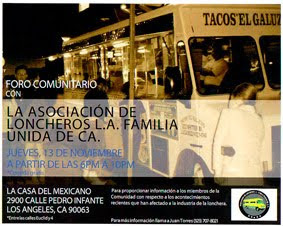 I tried this taco truck on 09/17/07 with a couple buddies and we were not too impressed. 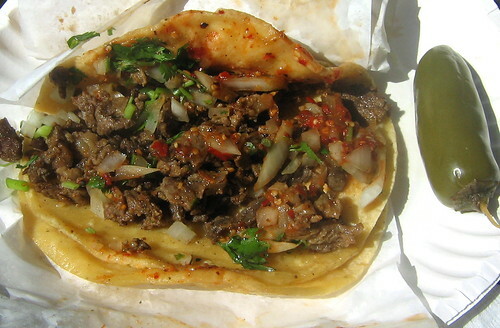 I picked at the asada and it was really flavorful but then I took a bite of the taco and I was disappointed. The tortillia was bland so it took away from the flavor of the taco. It made good tasting meat go to waste. I hope I went on a bad day because I plan on going back sometime. What time/days does this truck show up? The truck is there from about noon I believe. The tacos are good and big, and a great value. I prefer the Al Pastor tacos myself. Hey Bandini, you need to help us in the Inland Empire out. I moved to Pomona a couple of years ago and have yet to find a decent taco stand. LA ESTRELLA AND I GO WAY BACK TO THE MID EIGHTIES. THE FIRST TIME I TRIED THEM WAS AFTER MY FRIENDS AND I DEE JAYED A PARTY AND AFTER A LONG NIGHT WERE HUNGRY. WE DROVE BY THE TRUCK, BACK THEN IT PARKED IN FRONT OF THE LORENA PHARMACY, BOUGHT SOME TACOS AND WE FELL IN LOVE WITH THEM. WE WOULD GO EAT THERE EVERY CHANCE WE GOT AND WOULD RECOMMEND AND TAKE OTHERS TO EAT THERE AND ALL AGREED THAT THESE TACOS WERE AMONG THE BEST THEY TRIED. MY FRIENDS AND I NO LONGER LIVE IN BOYLE HEIGHTS BUT WE STILL DRIVE WITH OUR FAMILIES TO EAT THERE EVERY CHANCE WE GET AND I LIVE AN HOUR AWAY. IF YOU ARE EVER IN THE NEIGHBORHOOD STOP BY THE OUTSIDE IS NOT VERY PRETY THE FOOD (NOT JUST THE TACOS) IS GREAT REAL MEXICAN FOOD, YOU WON'T BE DISSAPOINTED.IF YOU EAT INSIDE TRY THEIR BIRRIA TACOS YOU'LL LOVE THEM. Gotta tell you, this is where GOD goes when he's feeling like carne asada or al pastor tacos. I've been eating there since at LEAST 1980 and the tacos are still simply the best. HUGE for the price (unchanged in 30 years) and orgasmically delectable, these tacos are worth a drive out from the IE for me! 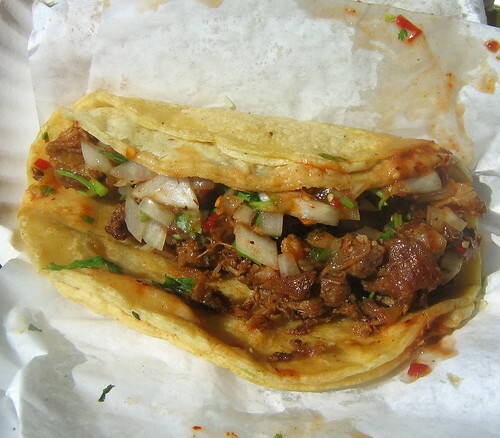 $1.25 gets you a taco built around hand-made tortillas, asada, al pastor, buche, lengua, tripas, they've got it all! At the corner of Lorena and Siskiyou in beautiful Boyle Heights, try it, you'll become addicted! OMG! I LOVE THESE TACOS! ME AND MY FAMILY HAVE BEEN GOING THERE FOR ABOUT 20YRS! THESE TACOS ARE THE BEST. THEY ARE NOT THOSE TINY LITTLE TACOS THAT MOST PLACES GIVE YOU. 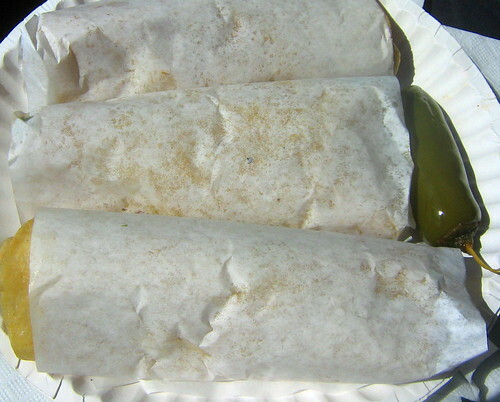 THEY ARE THE REGULAR SIZED TORTILLAS PACKED WITH PLENTY OF MEAT WITH ALL THE FIXINS. MY MOTHER WILL NOT ACCEPT TACOS FROM ANY OTHER PLACE. IF SHE ASKS FOR TACOS DE LENGUA, WE KNOW EXACTLY WHERE TO GO. SHE HAS GOTTEN PRETTY UPSET WITH MY SISTER WHEN SHE ENDS UP GOING TO ANOTHER TACO TRUCK OR STAND! SHE NOTICES RIGHT AWAY! THE FIRST THING SHE SAYS IS "DID YOU GET THESE FROM SOMEWHERE ELSE"? I KNOW BETTER THAN THAT. ANYWAY, THESE ARE THE BEST TACOS AROUND. I WILL CONTINUE GOING TO LA ESTRELLA UNTIL I NO LONGER CAN! I have been a customer of La Estrella (used to be known as El Michoacan back in the day) since 1985....as many have attested here the prices have remained unchanged quite a long time they went from $1.00 to $1.25 (wooptydoo!!) but these are defiitely not whimp tacos.....and everyone Ive taken to sample my little slice of Boyle Heights heaven has literally fallen in love with the tacos here. Now in recent years, something is going on indoors because the tacos from the truck are even better than the ones from the inside....(cant put my finger on it since they prep all the meat, salsa, and other condiments inside...must be the grill), but for the life of me I will only eat tacos from the truck!!! Now if you want anything other than tacos you have to go in to the restaurant itself but let me tell you.....you will not be disappointed....from the tostadas to the menudo (on the weekends it's served with handmade tortillas...yummo) it's very good and as close to momma-made food as you can get, and I think that's why so many people like it. But remember, if you're just hankering for some tacos do yourself a favor and order them outside and go ahead and meet your party inside and sit and enjoy your food, cause they dont mind.....your friends will be jealous that your tacos are so bombay....peace! !